In October 2017 I had holiday and of course I traveled to China again. Where to go this time? I have already seen a lot of the western parts of China. So completely a new area is difficult. 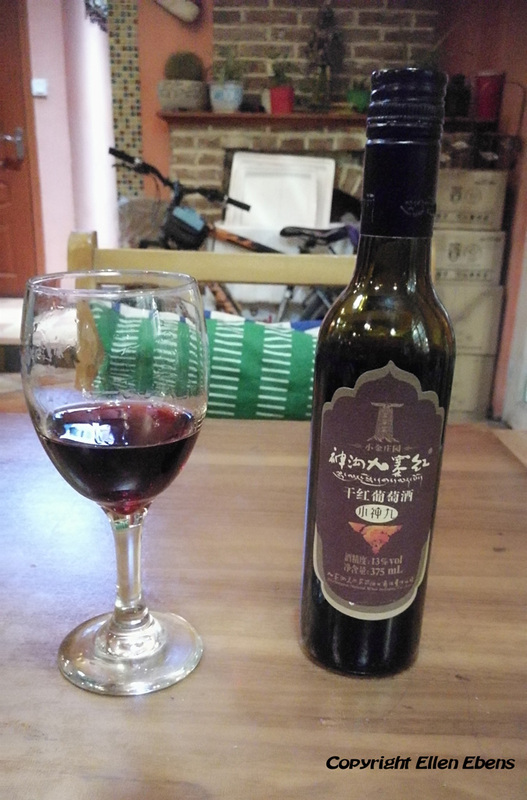 I ended up revisiting the province of Yunnan. With the KLM I flew directly from Holland to Chengdu (like I always do). From there I traveled south with my guide and my driver. Although I had traveled around in Yunnan two years ago (in October 2015), this was a totally different trip. I mostly visited different places and sites. 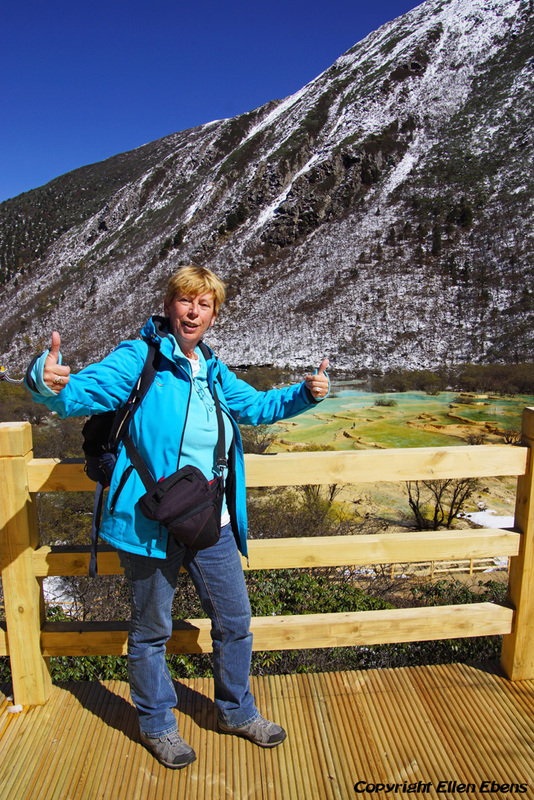 And although I again visited the ancient cities of Dali and Lijiang, I visited there also sites, who were new to me. 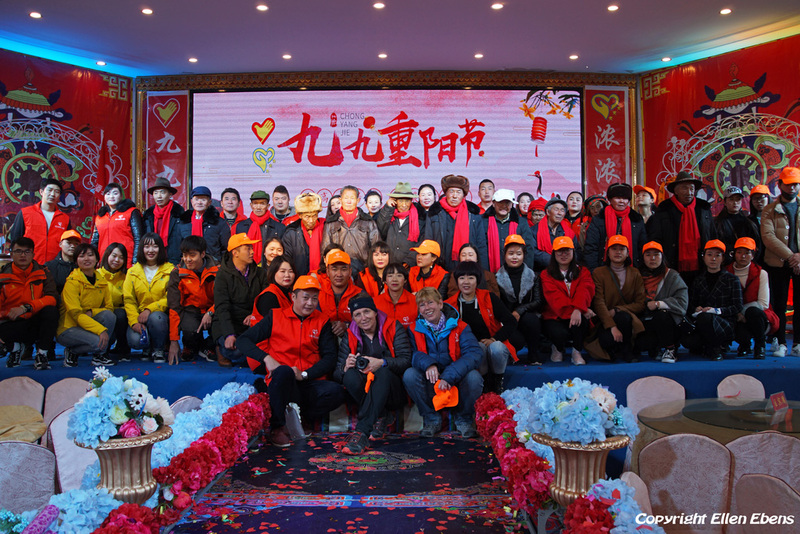 It was a round trip of totally 3 weeks in Yunnan. The trip ended again in Chengdu. But I still had a little more than a week to spent in China. 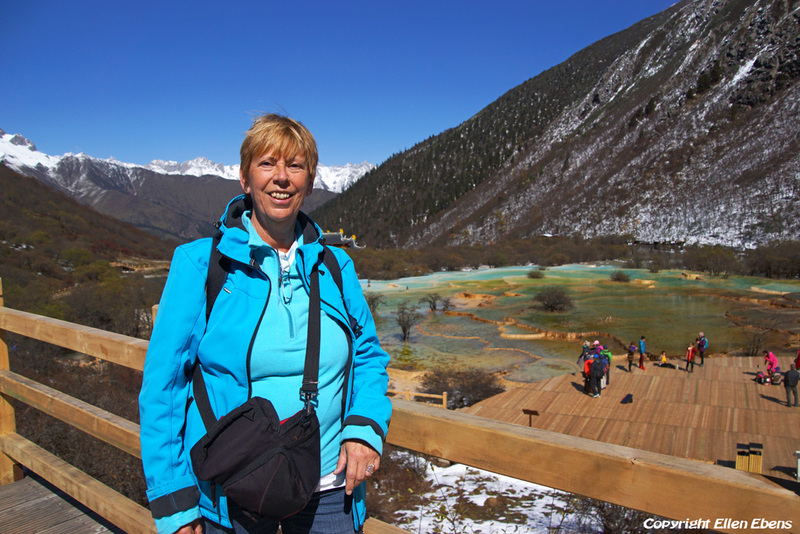 So I decided to revisit the ancient city of Songpan in the mountains of Sichuan Province. 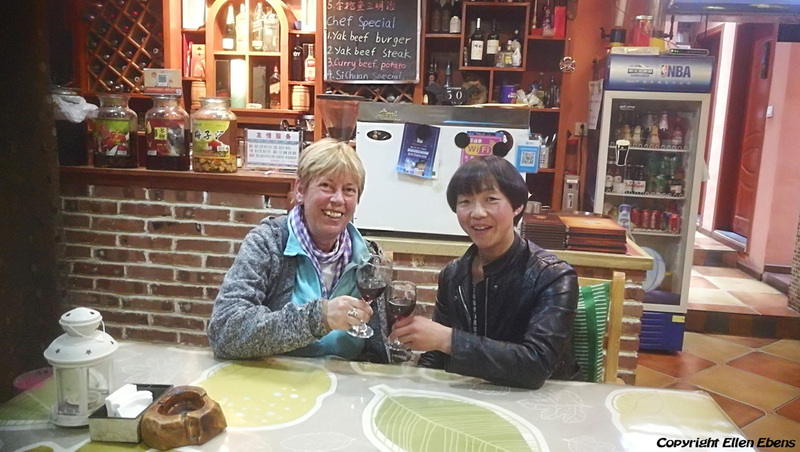 Last year I stayed about 10 days in Songpan in Emma’s Kitchen & Guesthouse. And I had promised Emma, that I would come back. As always my travel started in Chengdu. The day after my arrival in Chengdu, our drive south started. 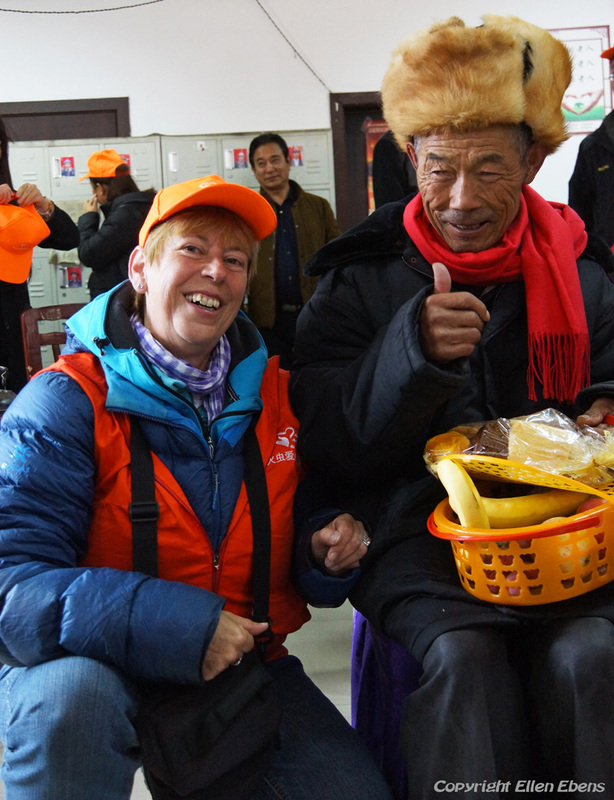 Near the end of the afternoon we reached the town of Zhaotong, Zhaotong is a town in the north of Yunnan province. When I say “our”or “we” I mean my guide, my driver and me. We had a hotel in the center of the town. Zhaotong is not very special but a friendly town. I could make some nice pictures there in the evening. 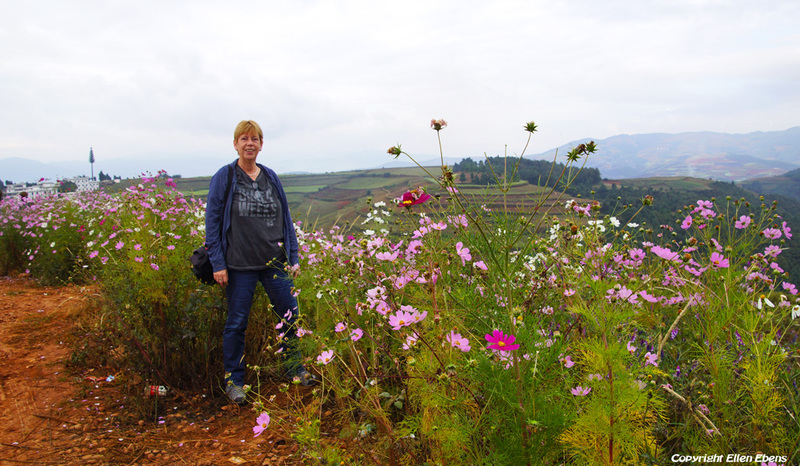 The next day we drove further south, to the Dongchuan Red Land scenic area. 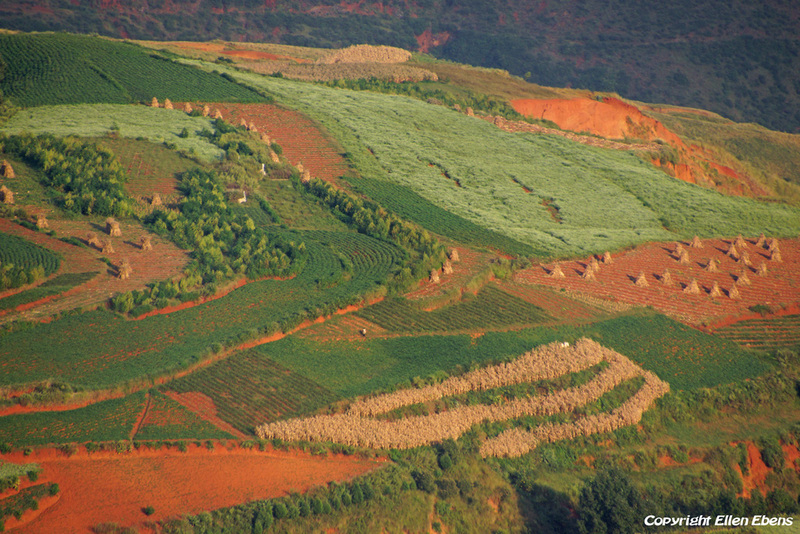 Donchuan Red Land is famous for the typical red soil. Soil that contains much iron and aluminum and showing an amazing crimson. 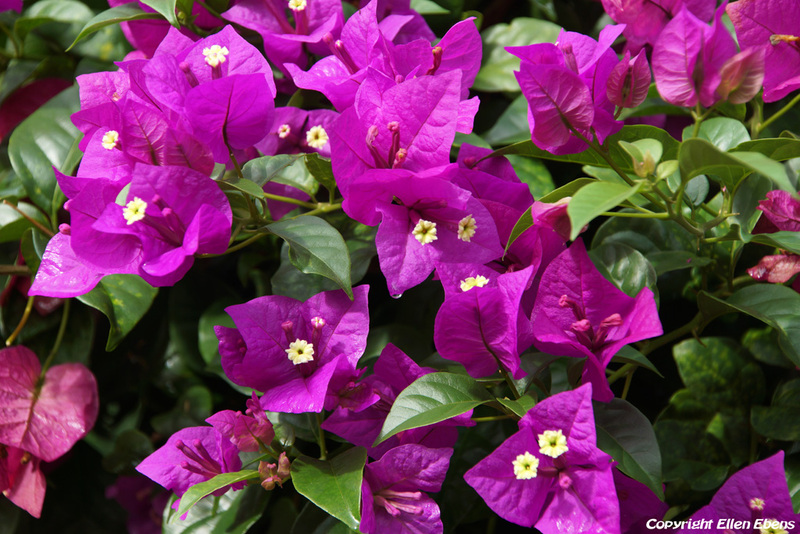 It is separated by colored fields and crops, forming all kinds of beautiful patterns. It forms a kind of paradise for photographers. 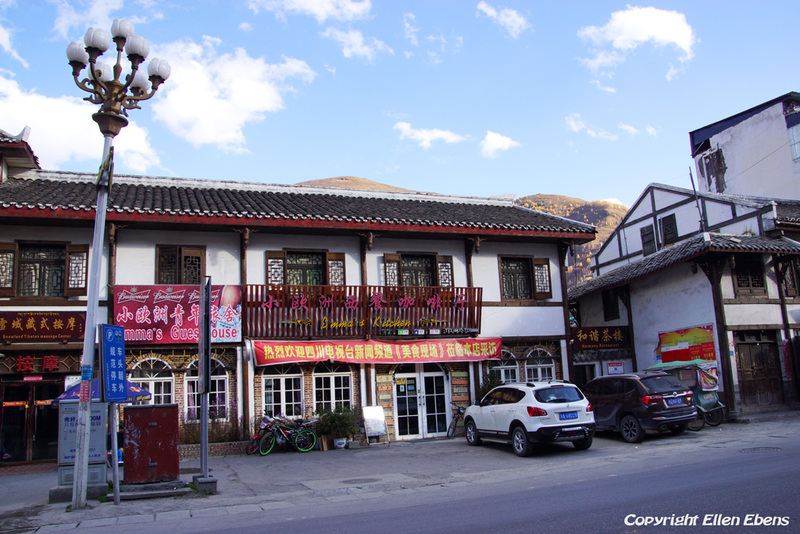 We stayed the night in a small family hotel at the village of Shuidongguawan. The next day we drove to Kunming, the capital of Yunnan. But first we enjoyed again the beauty of the Red Land. In the beginning of the afternoon we reached Kunming, where I spent some hours getting a Chinese sim card. Getting a sim card is a bit of a hassle the last years in China, because as a foreigner you can only get it with your passport at a headquarter shop of a provider. And there was a long row of people at the headquarter shop I visited. But I managed to get the sim card and from then on I was always online. 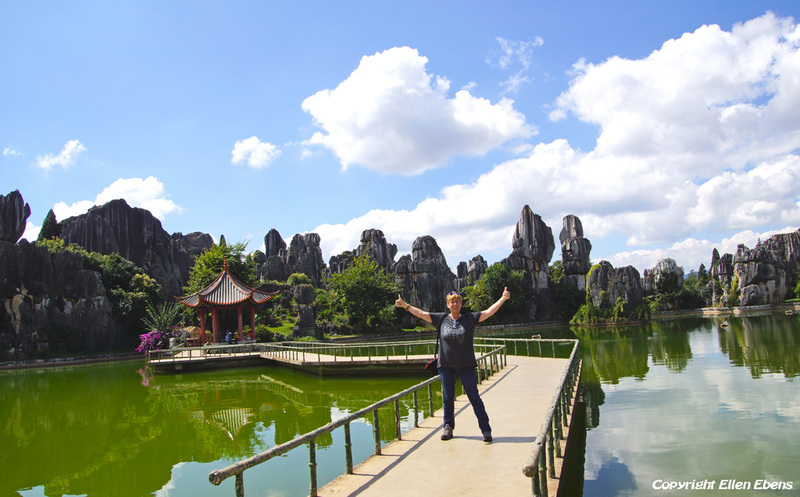 Near Kunming we visited Stone Forest at Shilin (as a day trip). 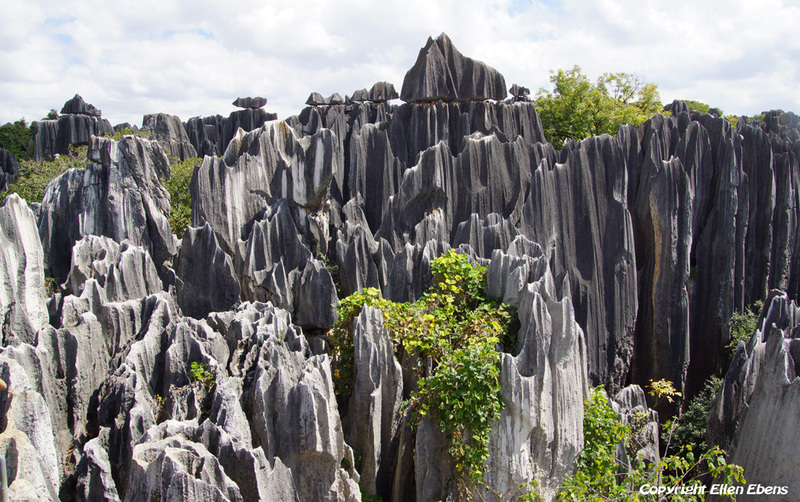 Stone Forest is a set of limestone formations. 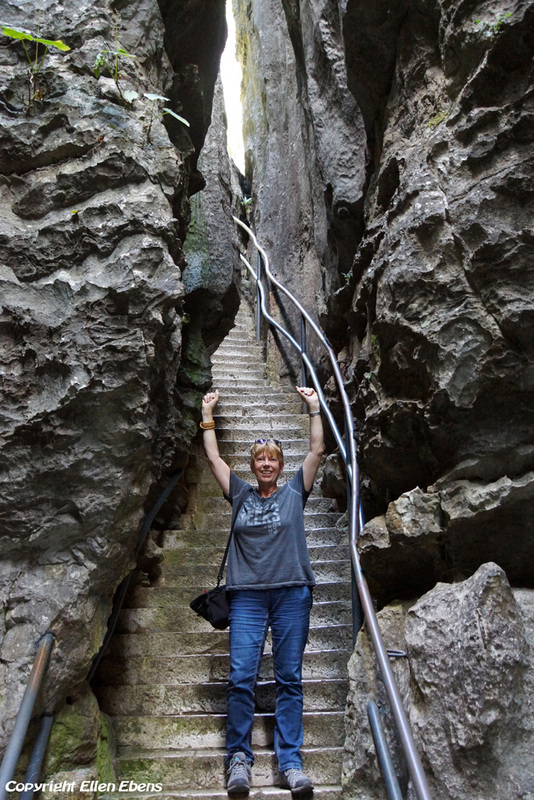 The tall rocks seem to arise from the ground in a manner somewhat reminiscent of stalagmites. With many rocks looking like petrified trees, thereby creating the illusion of a forest made of stone. I had feared it would be very crowded in the park with Chinese visitors. The so called Chinese golden week (holiday week) was just over. But luckily I was wrong about that. There were visitors but it wasn’t crowded at all. I’m normally not a person to dress up, but here I dressed up for a picture in the costume of a lady of the Yi ethnic minority. Personally I like the colorful picture. 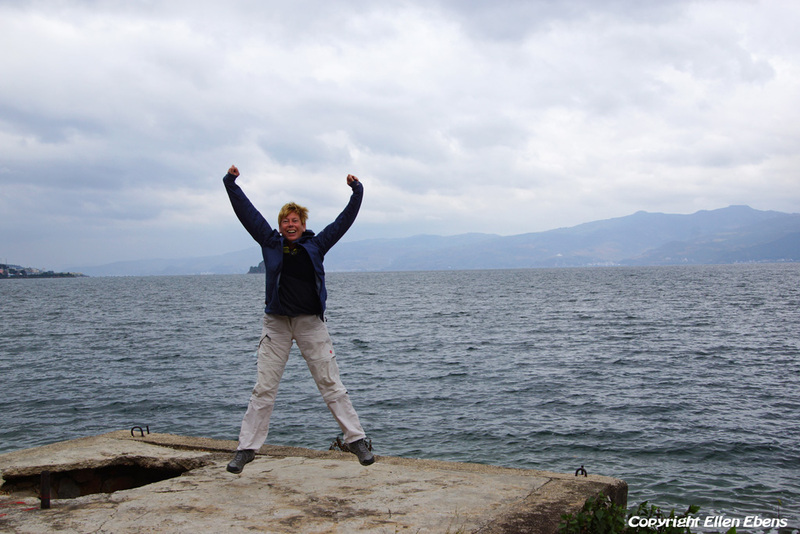 The next day we drove from Kunming a little south to Fuxian Lake. Fuxian Lake is a big lake and a tourist attraction in development. Here Chinese tourists come to swim in the lake. 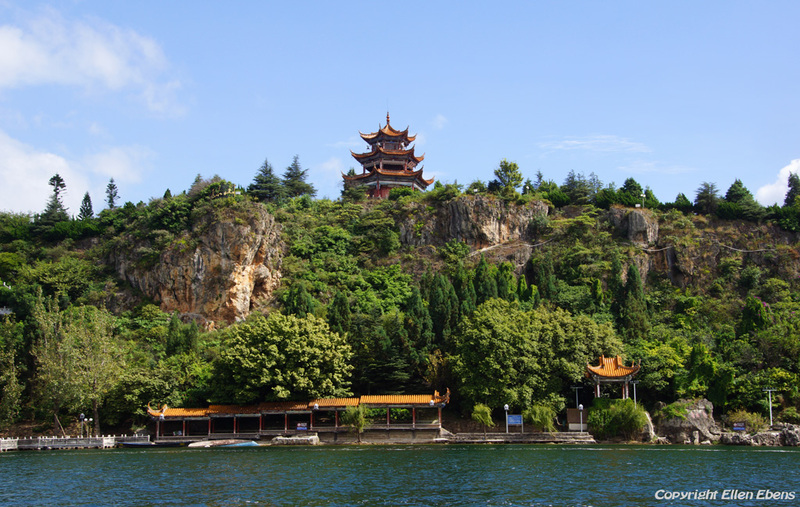 In the south of the lake is an island with a temple complex on it. It’s the only island in the lake. 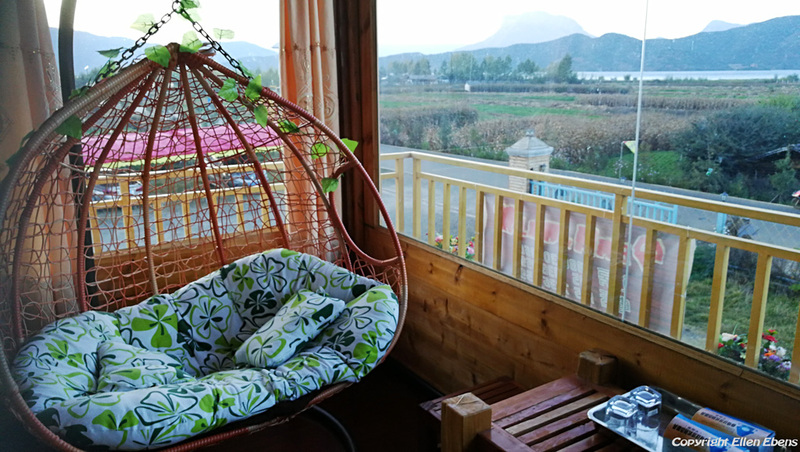 We stayed in an hotel at the shore of the lake near Jiangcheng Town and with view on the island. Of course we visited the temples on the island. The way to go there was by water cycle boat. That was a lot of fun. After Fuxian Lake we drove further south to the Xishuangbanna Dai Autonomous Prefecture in the far south of Yunnan Province. This region borders on Laos and Myanmar. 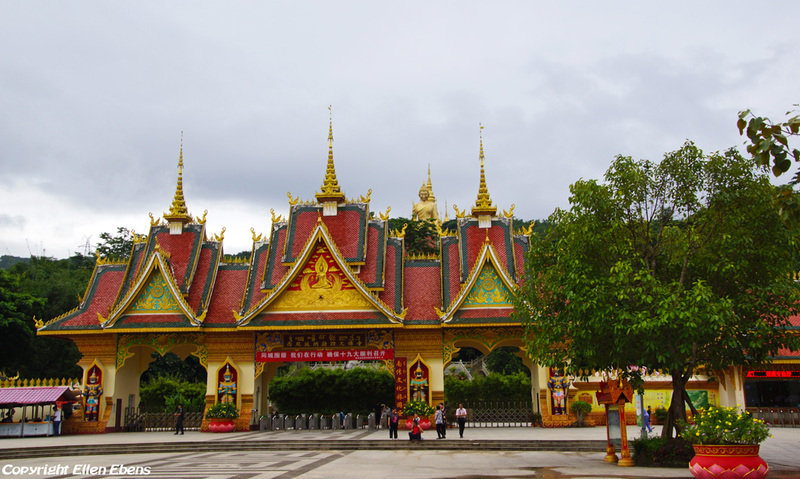 Xishuangbanna is the home of the Dai people. 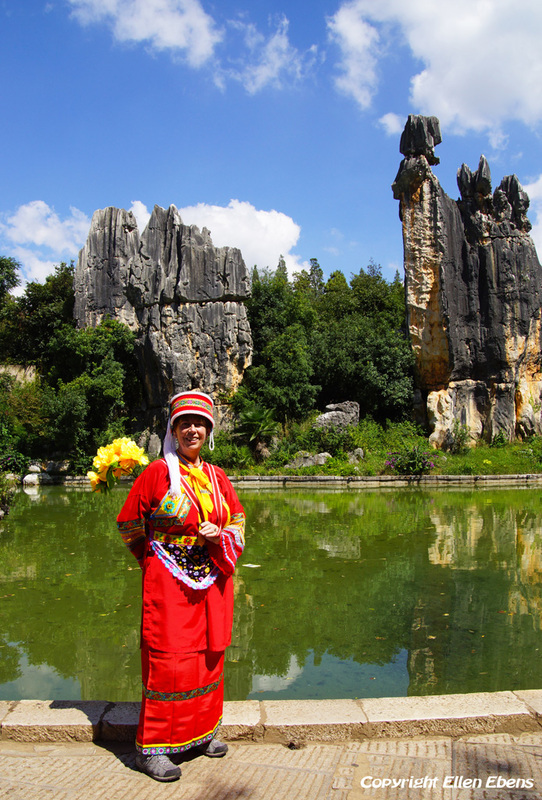 The region sits at a lower altitude than most of Yunnan, and borders on tropical climate. 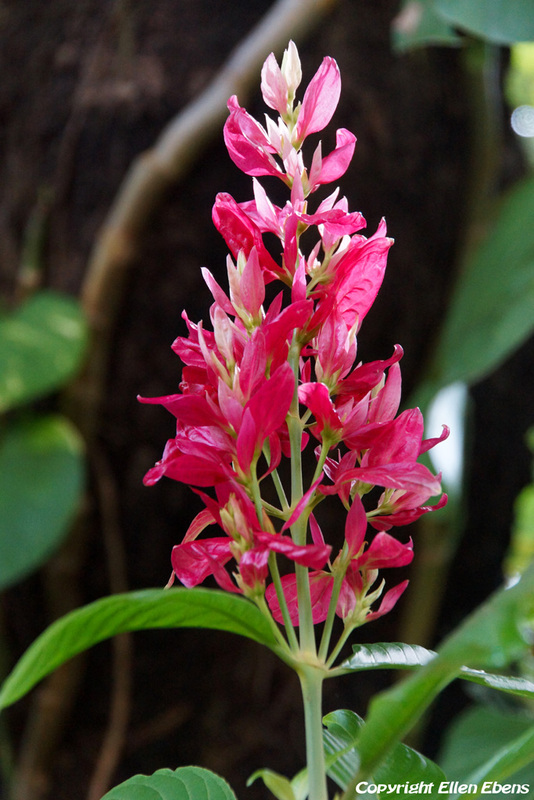 The people and the culture resemble that of the people and culture in Thailand and Laos. 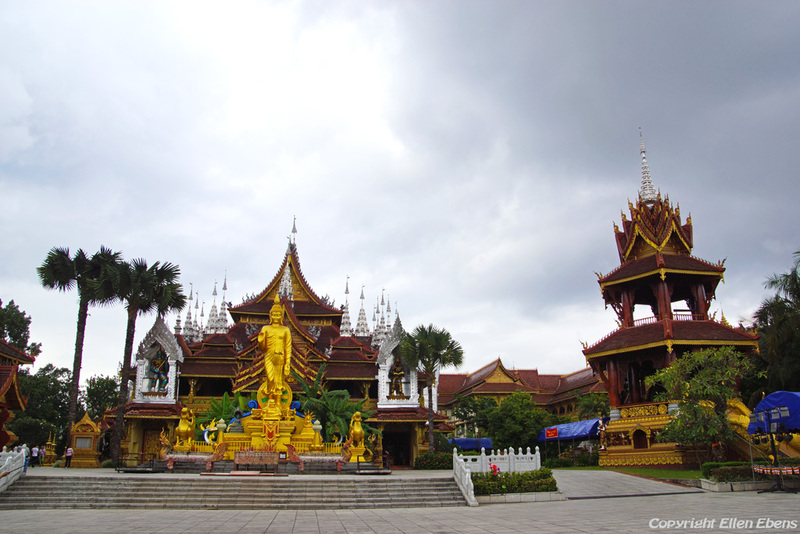 We stayed for some days at Jinghong, the capital of Xishuangbanna. At Jinghong we visited Manting Park with among other it’s big Buddhist Temple. 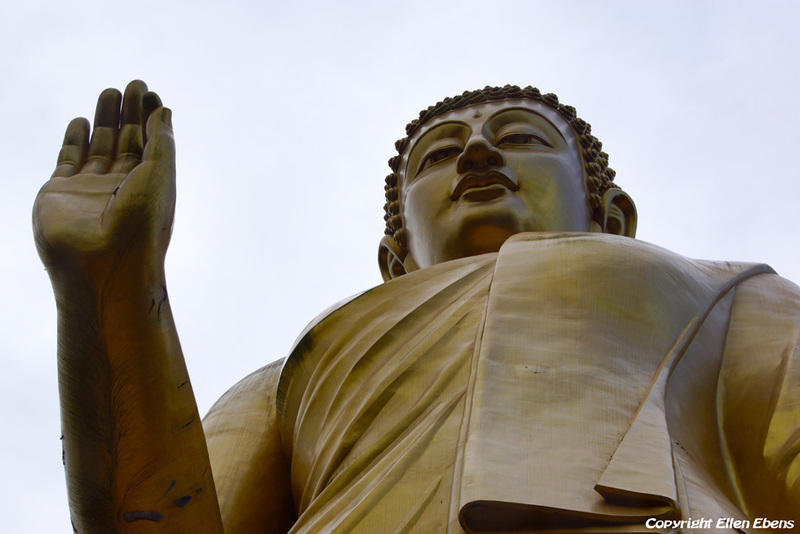 We also visited the Meng Le Temple near Jinghong with the big Buddha statue. 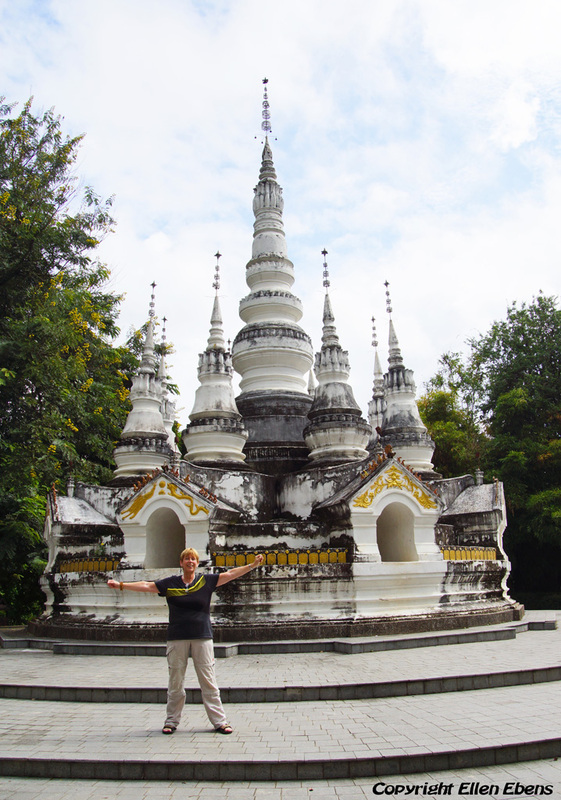 Very near the border with Myanmar we visited The White Bamboo Shoot Pagoda. 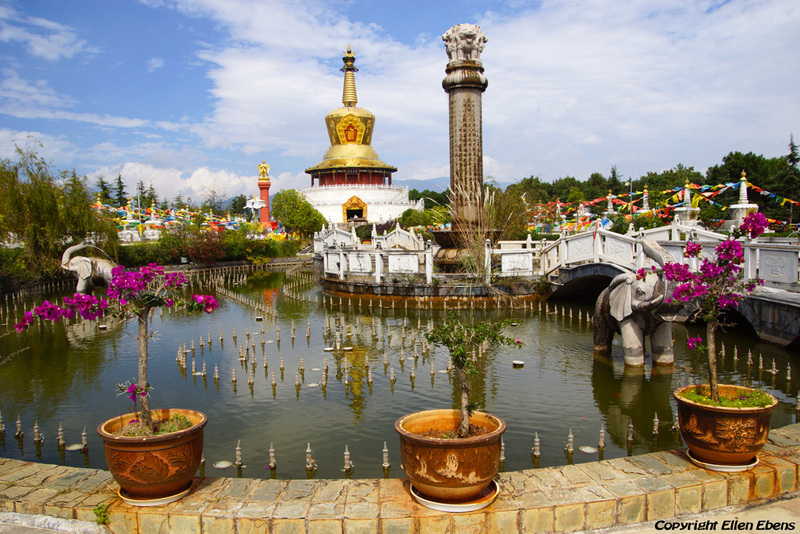 The temple and pagoda date to the year 1204 and is just outside the village of Menglong. After our visit to the deep south of Yunnan we drove north again. We didn’t make it to Dali in one afternoon driving. So at about 20.00 hours we stopped and looked for a hotel at the town of Lancang. Here we stayed only for the night and the next day we traveled on to Dali, which city we reached after a long day driving at about 20.00 hours. At Dali we stayed the next two days. 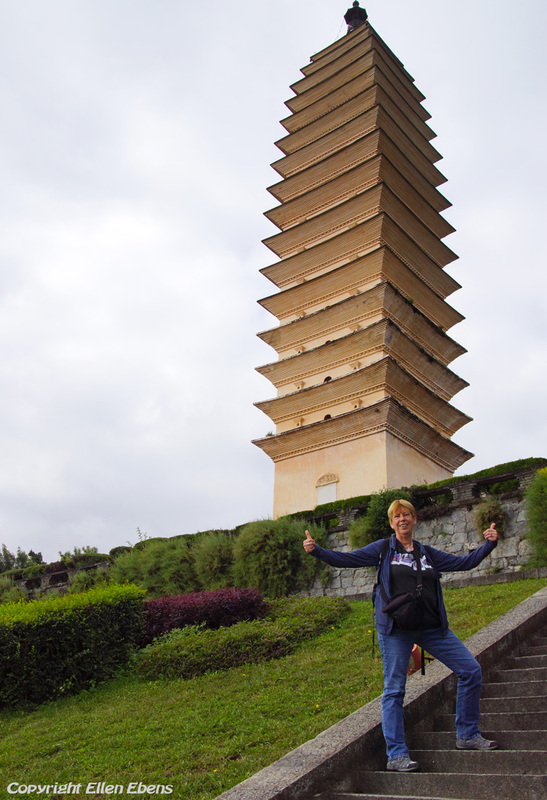 Of course we walked around in the ancient city of Dali. Although it has become very touristic, it’s still a nice and friendly place to visit. 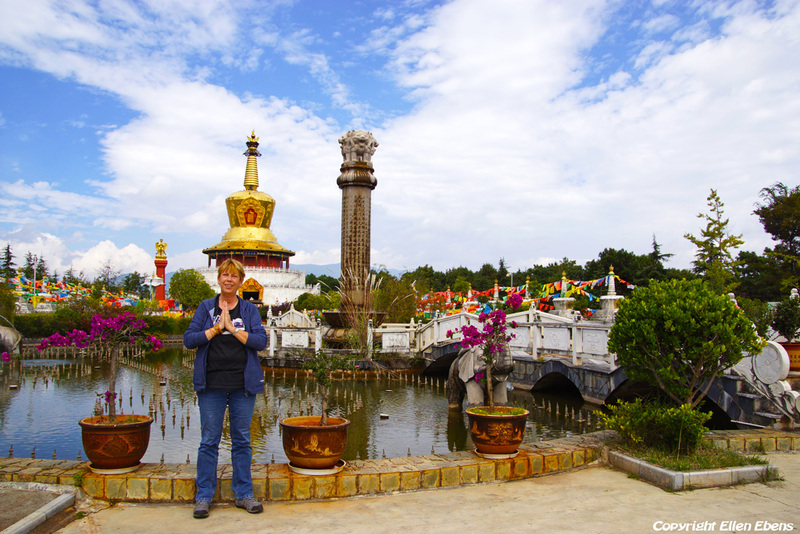 The second day we visited the Chongsheng Temple with it’s famous three pagodas just outside ancient Dali. I must say, the temple complex was much bigger then I had imagined. So we spent hours there. Next on our trip was Jizushan (Jizu Mountain). I had never heard of this mountain. But it was worth the visit. 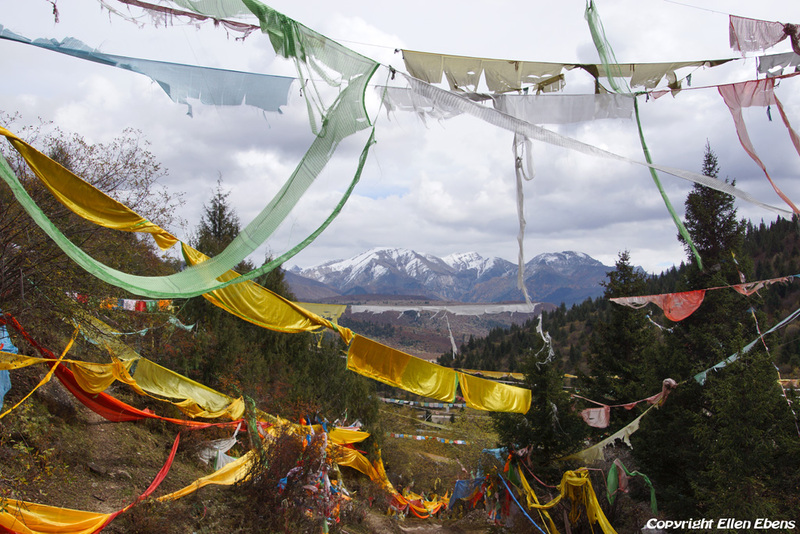 Jizushan is a famed holy mountain in Buddhism. 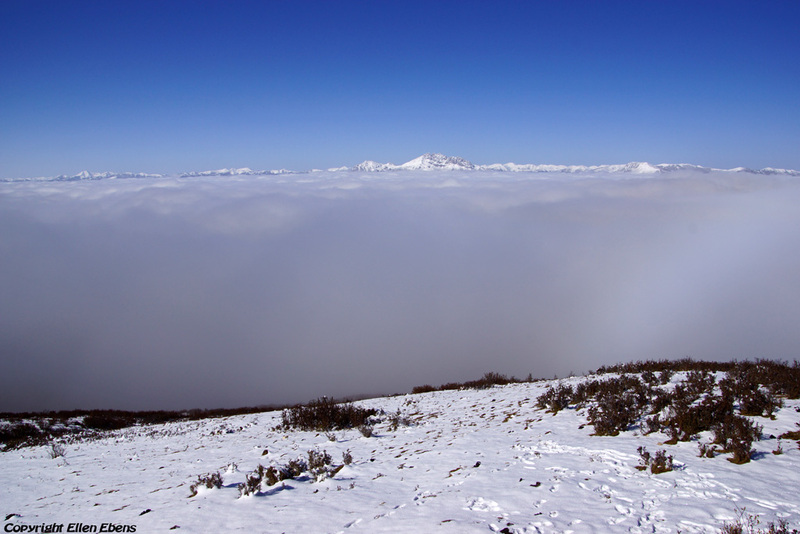 Its main peak, Tianzhu Peak, rises some 3,240 meters above sea level. 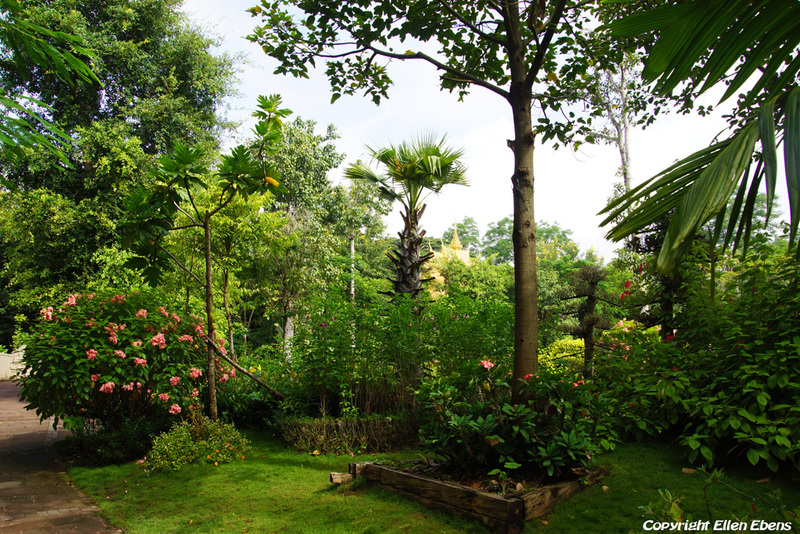 The mountain is vegetated with dense forests and bamboo groves. 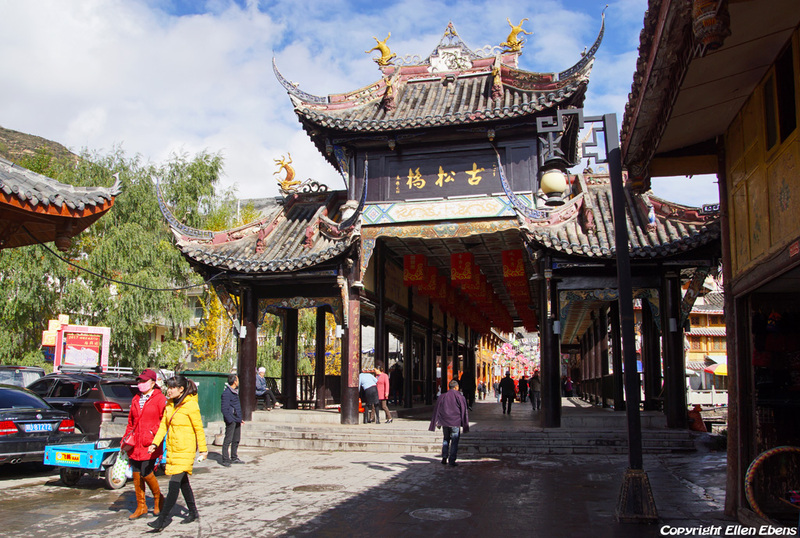 Since nearly 1300 years Jizushan attracts Buddhist pilgrims from all over China, including Tibet. 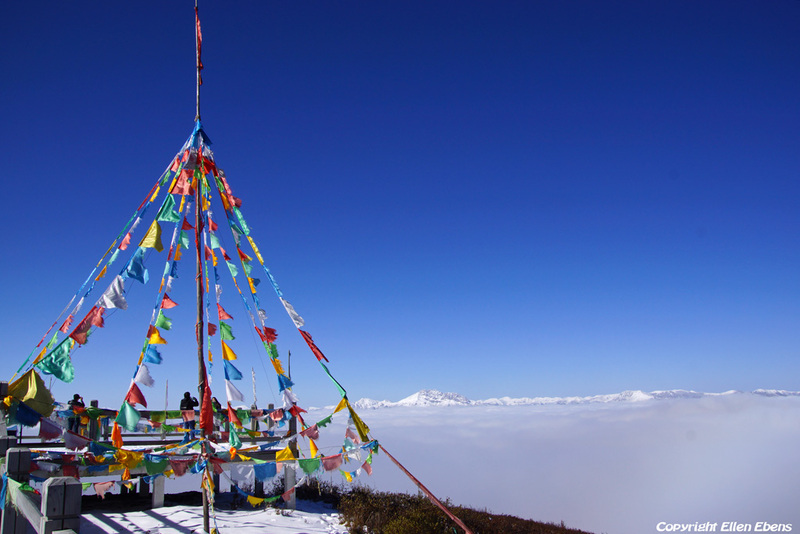 Jizushan ranks among the 5 most important Buddhist Mountains in China. Once there were over 300 magnificent Temples, Pagodas and Pavilions on the mountain but they were damaged or vanished during the Cultural Revolution. Nowadays there is a lot of construction work done on the temples. There now are surely at least 26 temples, big and small, and the construction work goes on. A painting on the wall of our hotel there showed how Jizushan looked like. 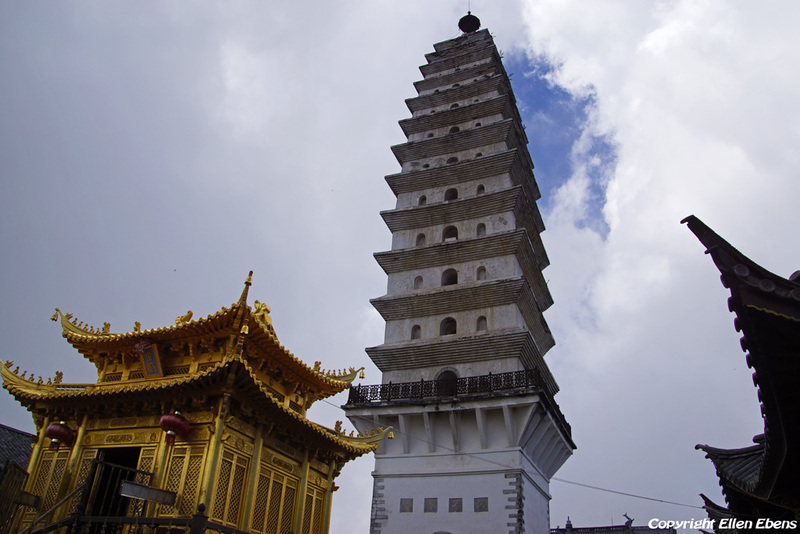 Jizushan is best known for Zusheng Temple with its 13 storey high Jinding Pagoda. You can drive op half way on the mountain and then you have to park the car. Next there is a bus and a cable car going to the high summit of the mountain. After visiting the pagoda on the top we took the cable back but walked further down the mountain and through the woods till the parking lot. And looked at other temple complexes on the way down. It was such a pleasant and relaxing few hours walk. 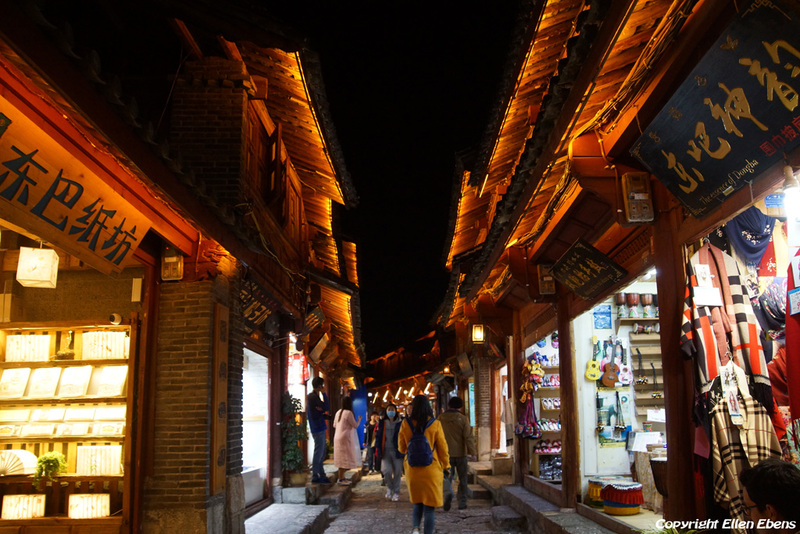 Lijiang is a nice place to visit although the ancient city of Lijiang is (also) very touristic. 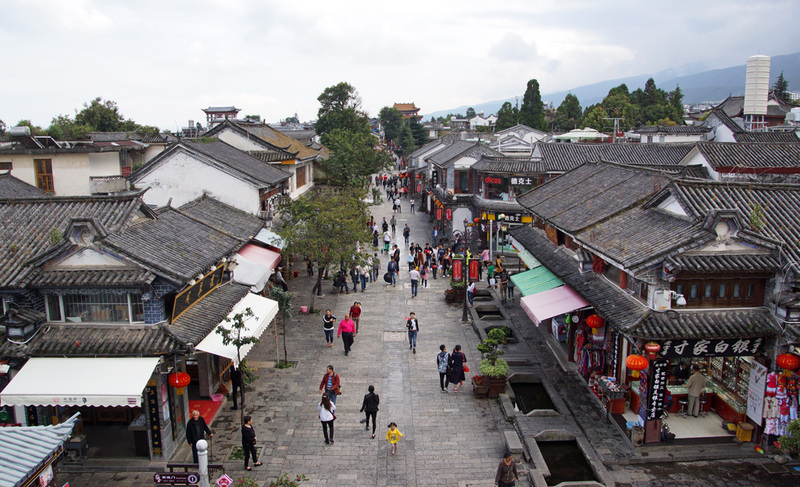 An advantage of Lijiang above Dali is, that the whole ancient city is car free. 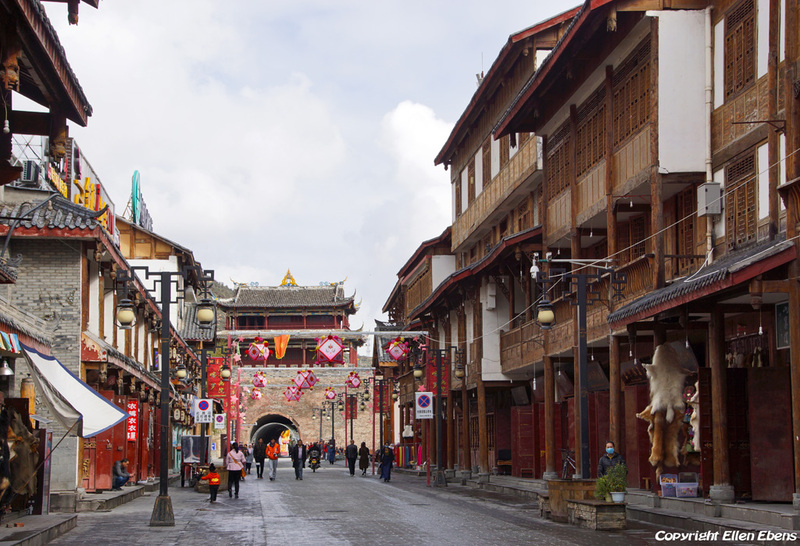 It’s impossible to drive with cars in the small streets of old Lijiang. 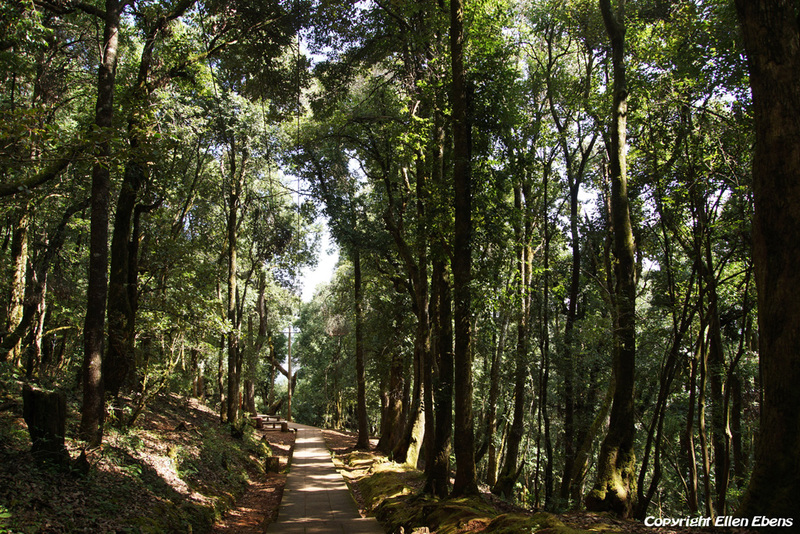 At the outskirts of Lijiang, on Sheshan (Snake Hill) is the Lijiang Jinta scenic area. 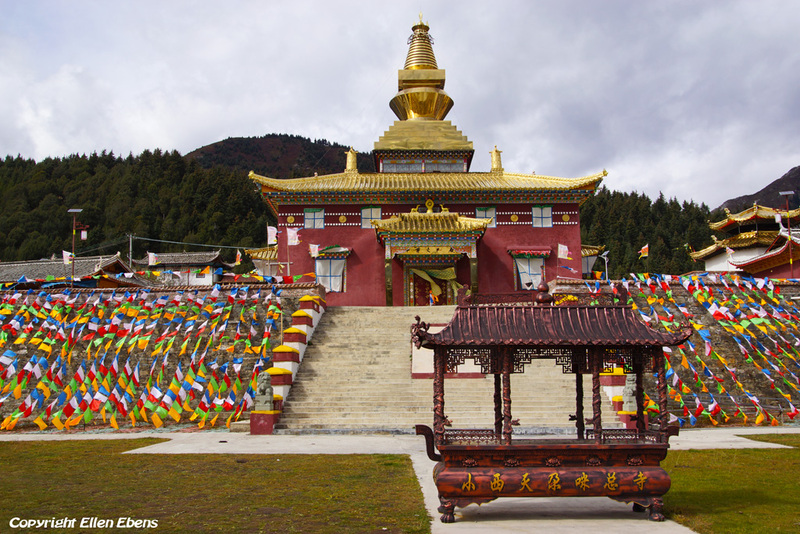 In this area Tibetan and Chinese Buddhism are integrated. 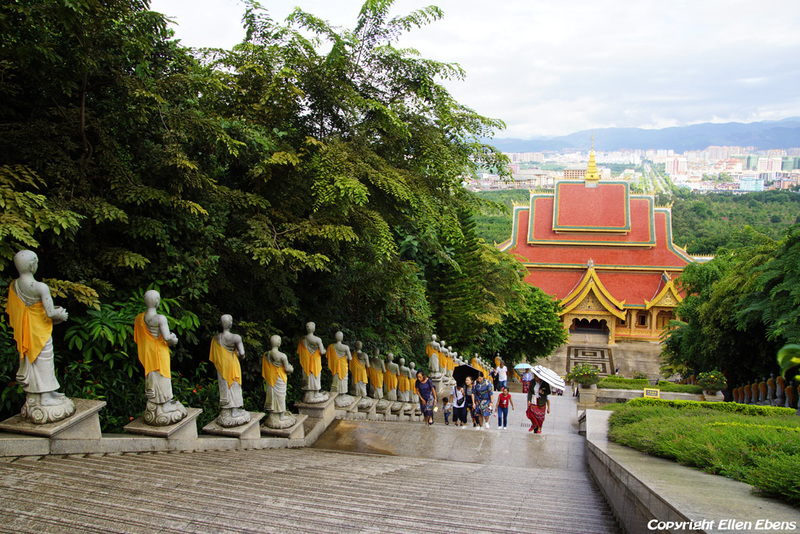 You find here the Golden Pagoda and Buddhist halls and statues, surrounded by a beautiful and peaceful park. It’s really quiet and peaceful here because it’s not (yet) a tourist attraction. And you don’t have to pay an entrance fee for visiting it. After Lijiang it went further north to Chengdu. 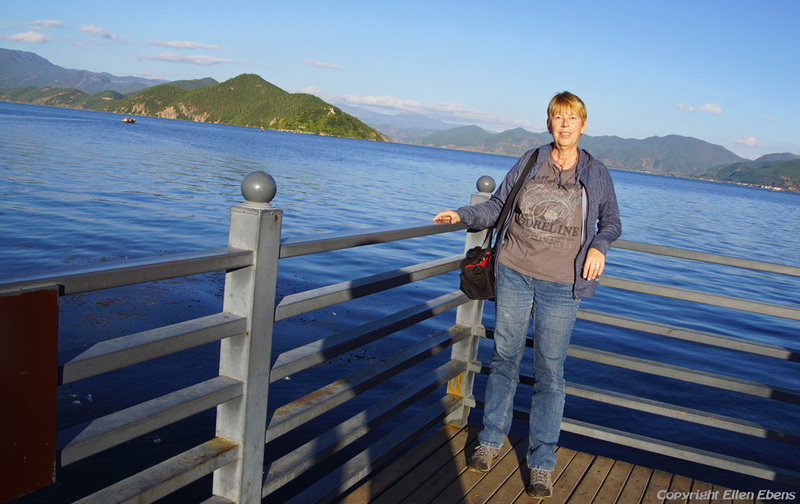 But we visited Lugu Lake on the way. 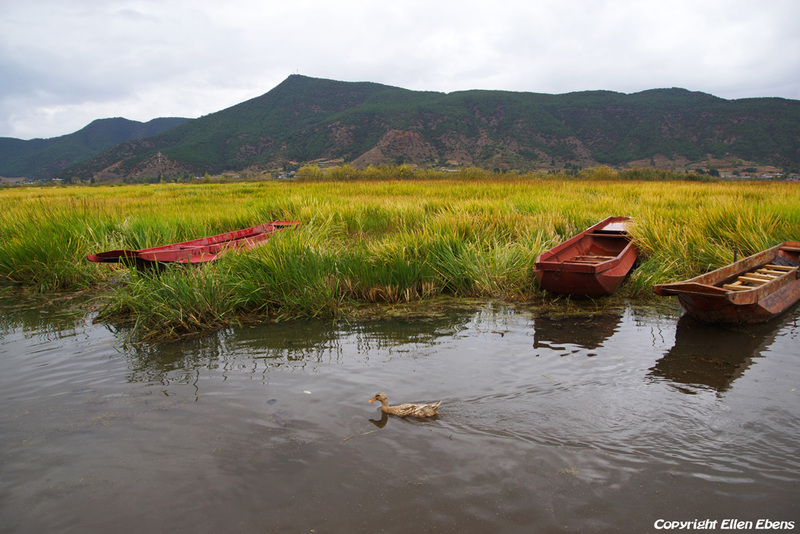 Coming from Lijiang you enter Lugu Lake from the mountains. After entering the park (yes, Lugu Lake is a park and you have to pay an entrance fee) you have a magical view from above on Lugu Lake. At least when the whether is nice and sunny and the lake is coloring totally blue below you. 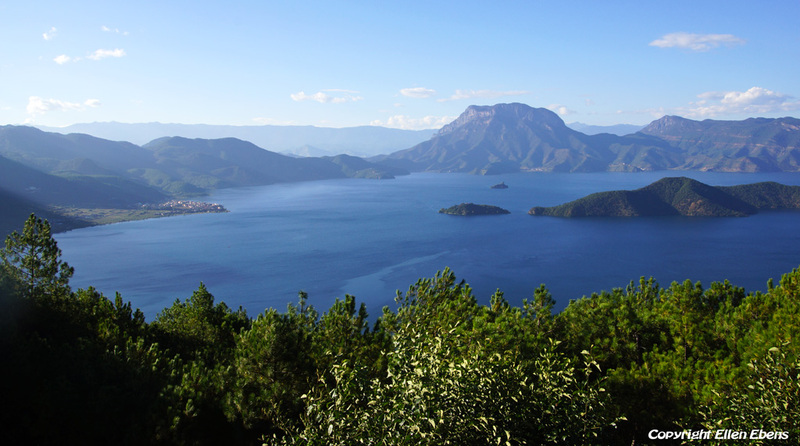 Lugu Lake is also an important tourist spot for the Chinese and the prices of the hotels at the lake are high for Chinese standards. 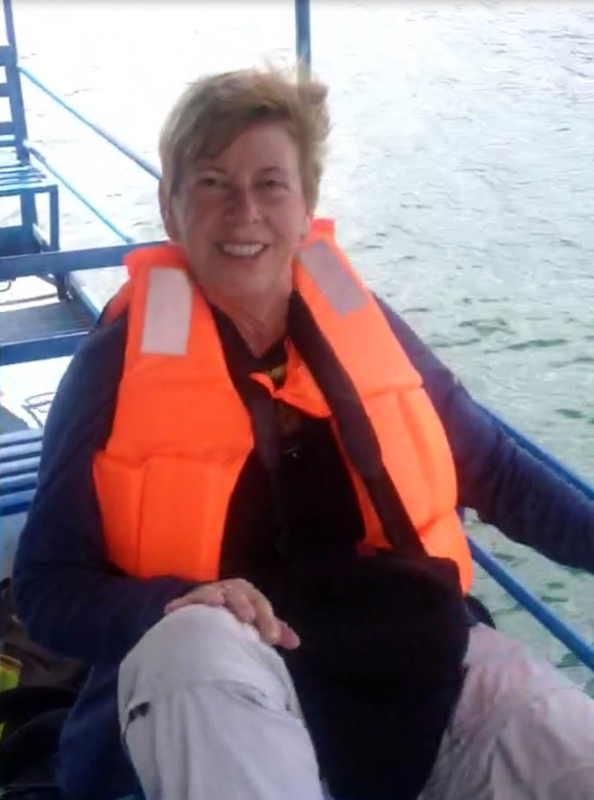 We looked for a hotel with a more affordable price and found that in the form of a “boat” on the shore. 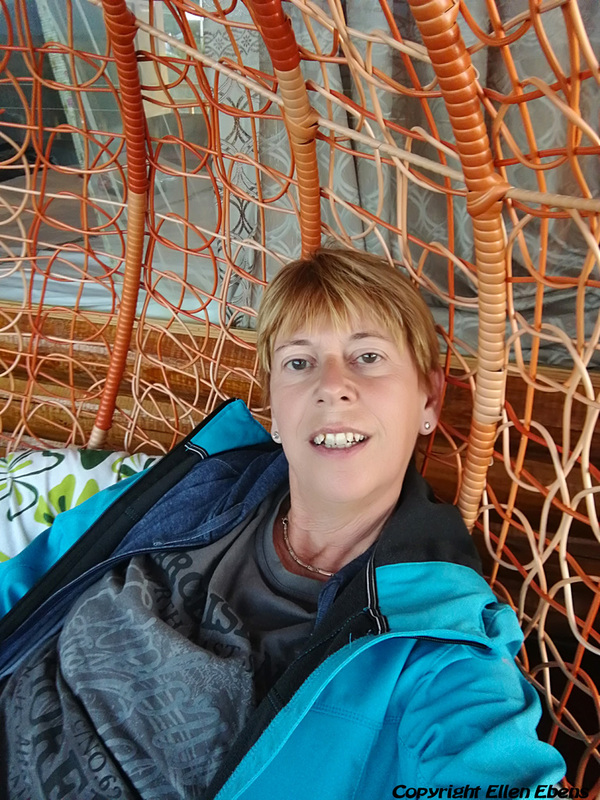 I had a very nice room there, with an indoor, covered balcony, with a swing chair overlooking the lake. The next day, the weather wasn’t sunny but it gave a more mystic touch to my pictures of the Caohai wet land area in the northwest of Lugu Lake. 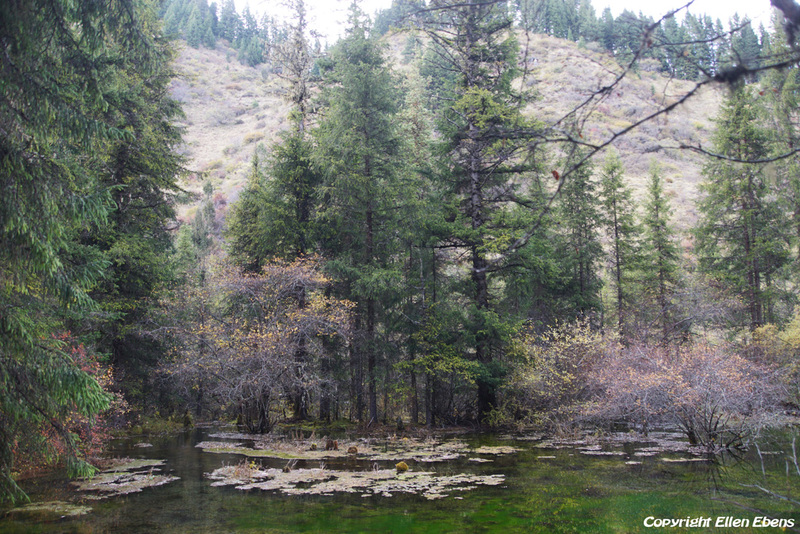 It’s a grassy plateau lake and was beautiful in autumn colors. 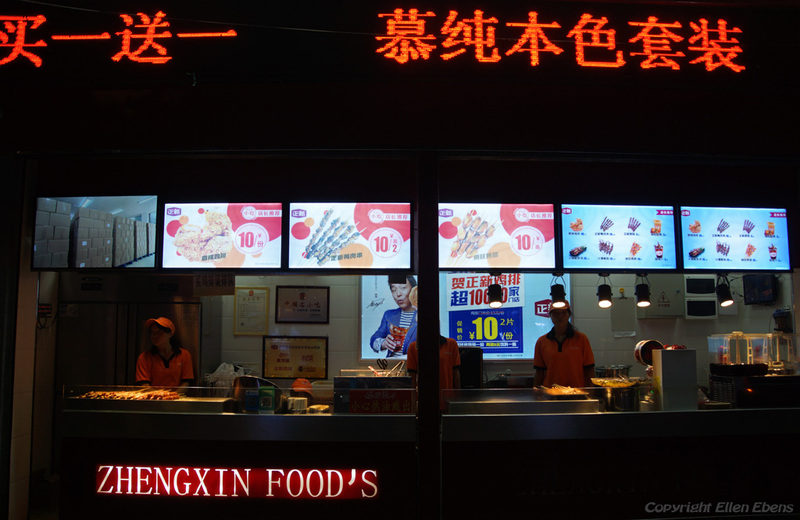 After Lugu Lake it went to Chengdu with an overnight stay at a hotel in the town of Miancheng. At Chengdu we had a lazy, shopping day. Last year I was about 10 days in Songpan, where I stayed at Emma’s Kitchen & Guesthouse. I had a good time there. Songpan is a lovely, old and walled town. 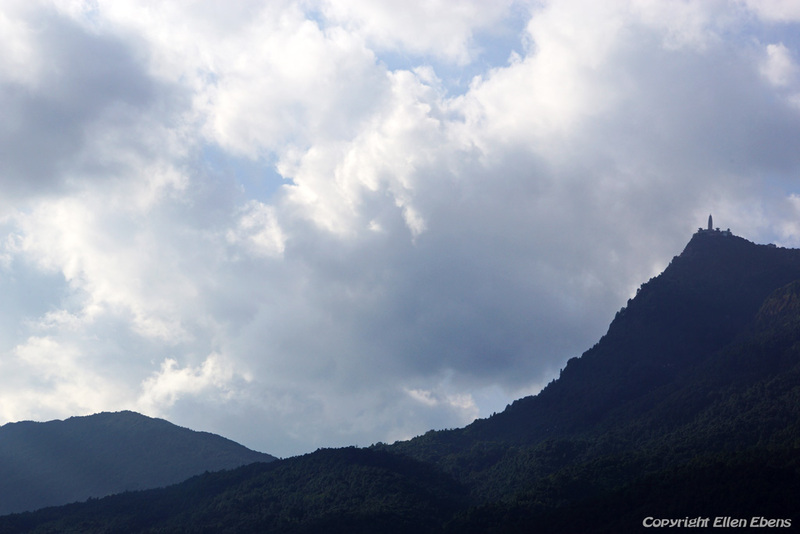 The mountainous scenery around Songpan is very beautiful. 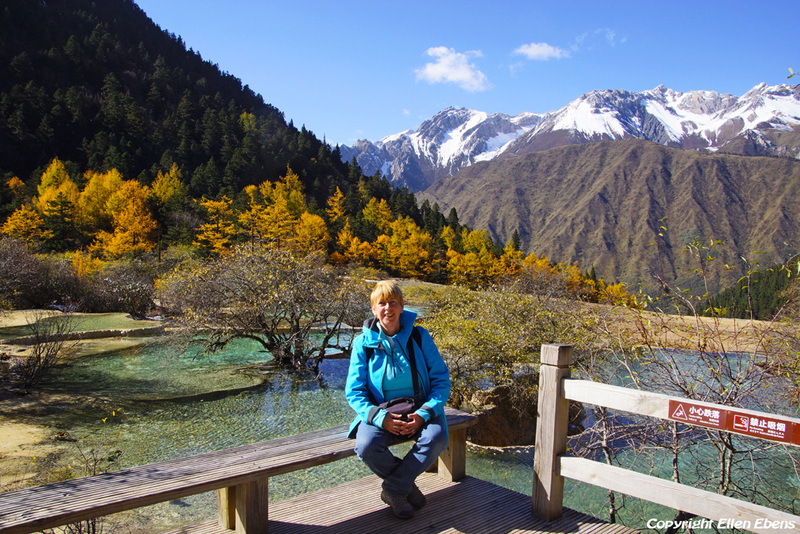 And there are great National Parks around Songpan. 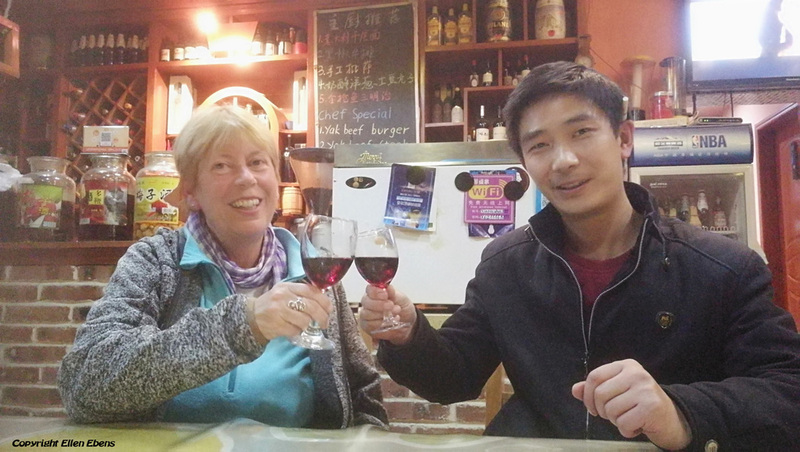 I had promised Emma I would come again to Songpan and so I did the last week of my holidays in China. Of course I walked around in Songpan. And Emma invited me to go with her to a special event. 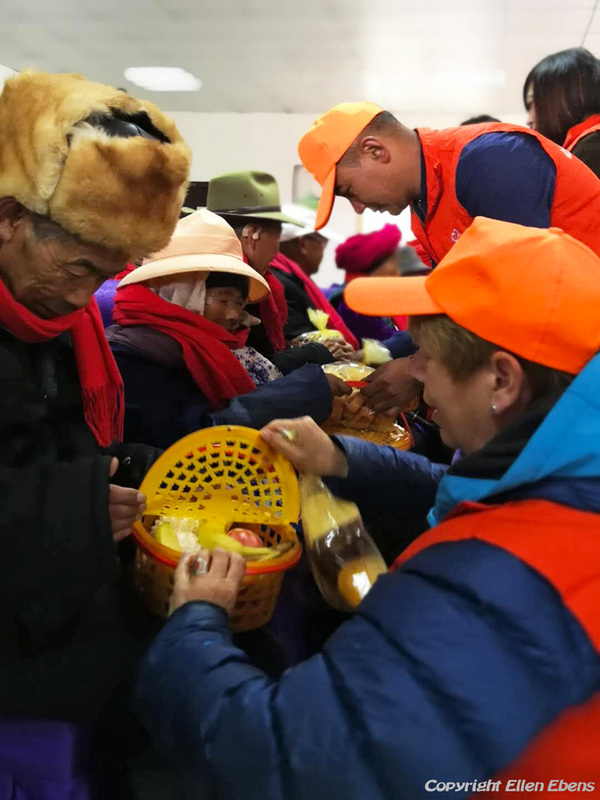 Because soon it would be the elderly people’s day Emma’s charity organization paid attention to the elderly people in the home for the elderly. In this home there live people who haven’t kids or other family to take care of them. In the morning I went with Emma and other people of the charity organization to the elderly home and the elderly got some presents. Then they were driven to a restaurant and were treated to food and songs. It was so special to be there and I enjoyed it very much. The television was there also and I was interviewed. And they made a video of me giving a present to an elderly man. 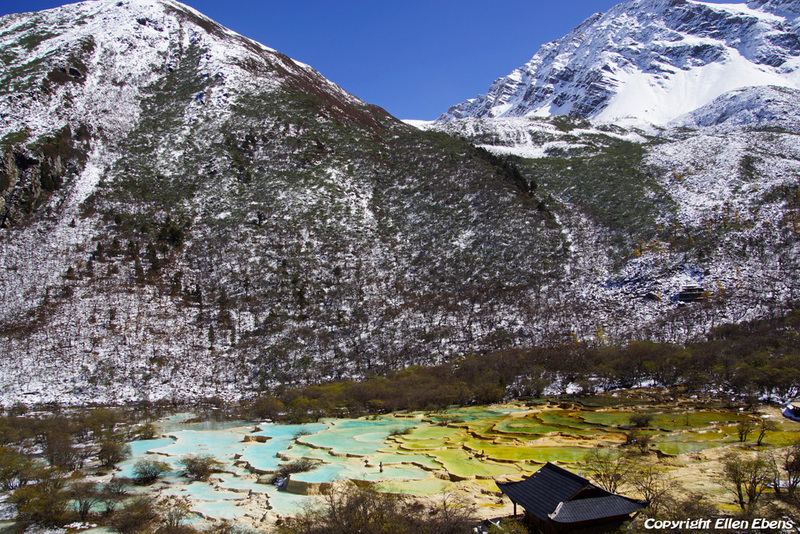 Of course I revisited the beautiful National Parks of Huanglong and Mounigou in the vicinity of Songpan. 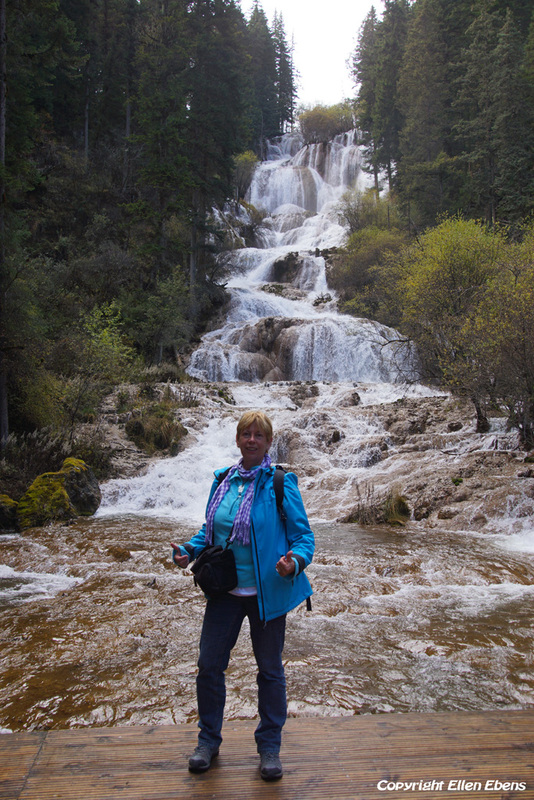 I also visited Zhaga waterfall near Mounigou. And I went to Danyunxia Scenery. It’s a small gorge, 18 km long, and with the autumn colors so incredibly beautiful. 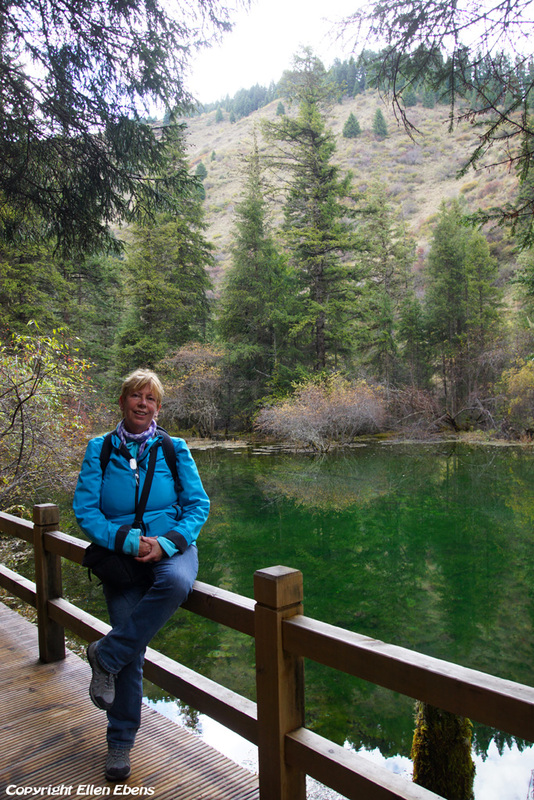 Unfortunatly I couldn’t revisit Jiuzhaigou NP because of the earthquacke that had taken place in August 2017. The epicenter of this earthquake was below Jiuzhaihou NP and the park and the hotels near the park are damaged. Probably the park will remain closed for the coming years. 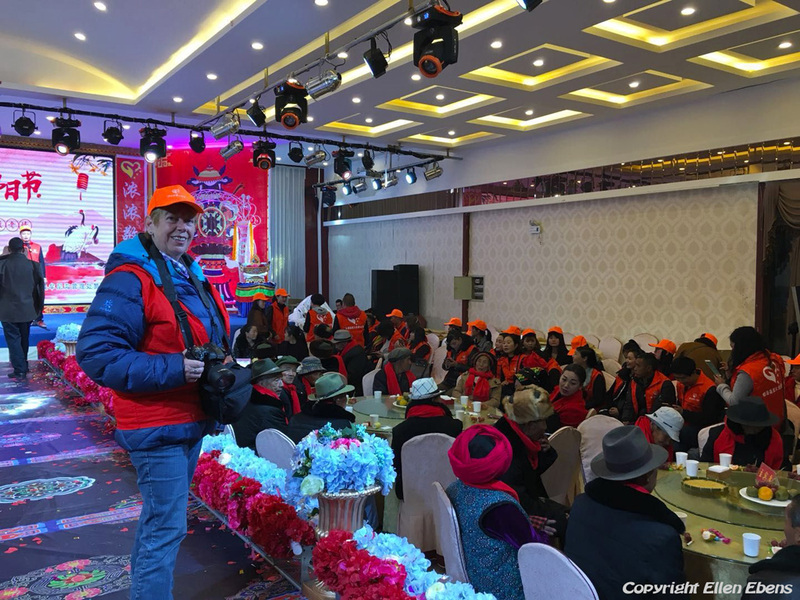 My last day in Songpan I filled in with Tibetan culture. I went to Shanba village and visited there Kyangtsang Temple, which is a Bönn temple. And I visited a sacred place in a small valley where a high lama has been buried. 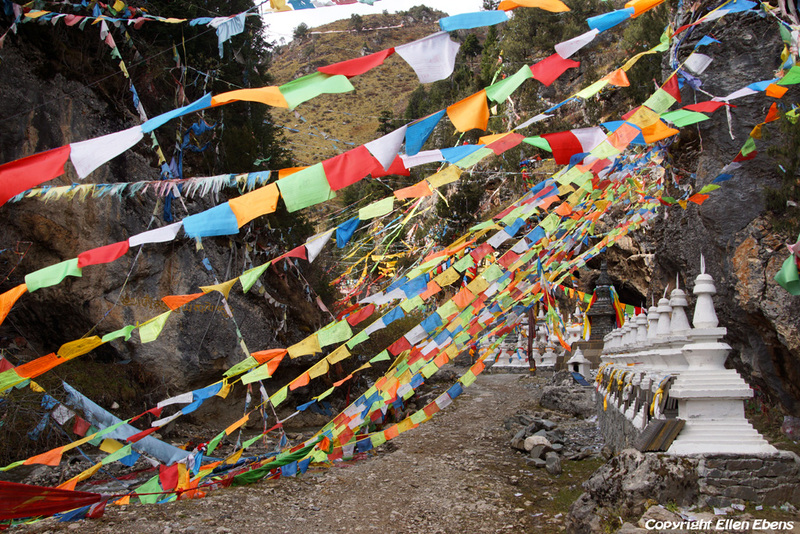 There were a lot of stupas and prayer flags there. It was so quiet and peaceful there. The next day I took the public bus to Chengdu and checked in at my hostel there. 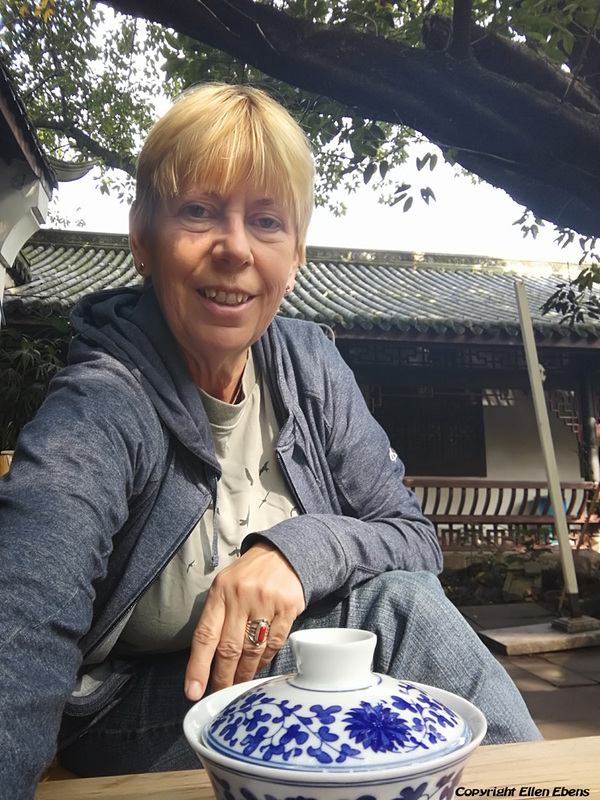 One more day in Chengdu remained and I filled it with enjoying tea at tea terraces at the Wuhou Temple and Peoples Park. It was a good day for tea terraces because it was great, sunny autumn weather with a totally blue sky. 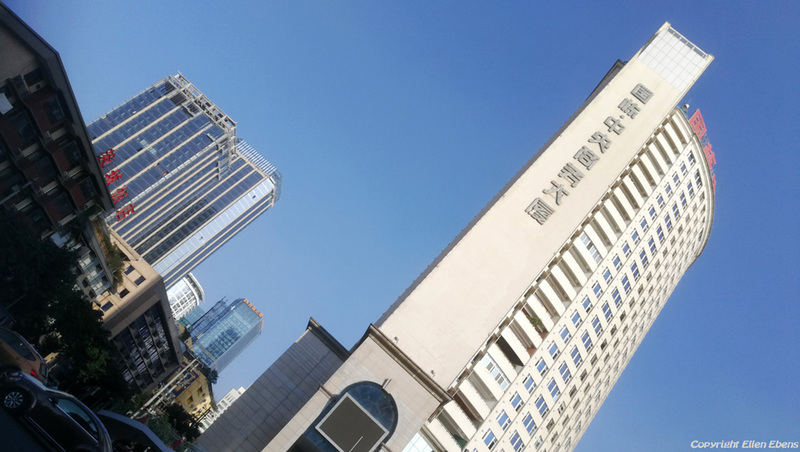 And you don’t often have blue skies at Chengdu because of the smog! So I was lucky. And then my trip was over and the blue bird took me home again. This time during my travel in October I had a lot more rain then on my other travels in the month October in China. Some days it rained for most of the day. Luckily that was on days I was traveling by car of bus. And not really on days I visited places. 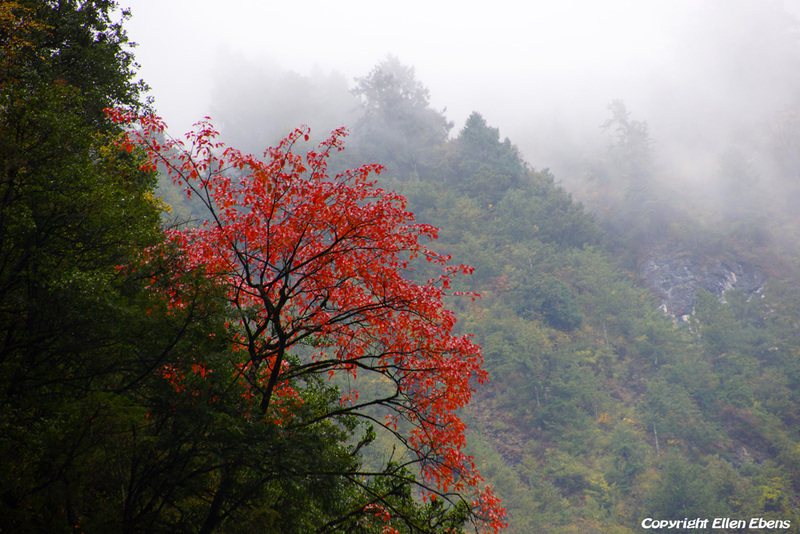 But when it rains, the rain in higher parts of the mountains in the Sichuan province falls as snow. That’s why I had snow on the high Xueshanliang pass (Snow Mountain Pass), which you have to cross going from Songpan to Huanglong NP. When we left Songpan by car it was very cloudy and foggy. And when climbing up to the pass, we had almost no visibility. But on the pass, we had a clear blue sky with the clouds beneath us and the white mountains surrounding us. It was so beautiful! And in the park itself there was also snow on the surrounding mountains. That made my visit to this park different from my visit last year October. The rainfall meant that Mounigou NP there was a lot more water in the ponds in the park in contradiction to my visit a year before. So on this trip I went from the tropics in Xishuangbanna to the snow in the mountains of Songpan. And I loved all of it! I now will start working on all the pictures I took during this trip. It will take a while before I can publish them as albums in the portfolio on my website. But they will come for sure! So stay tuned in. Driving to Fuxian Lake and staying near Jiangcheng Town at the shores of the lake. 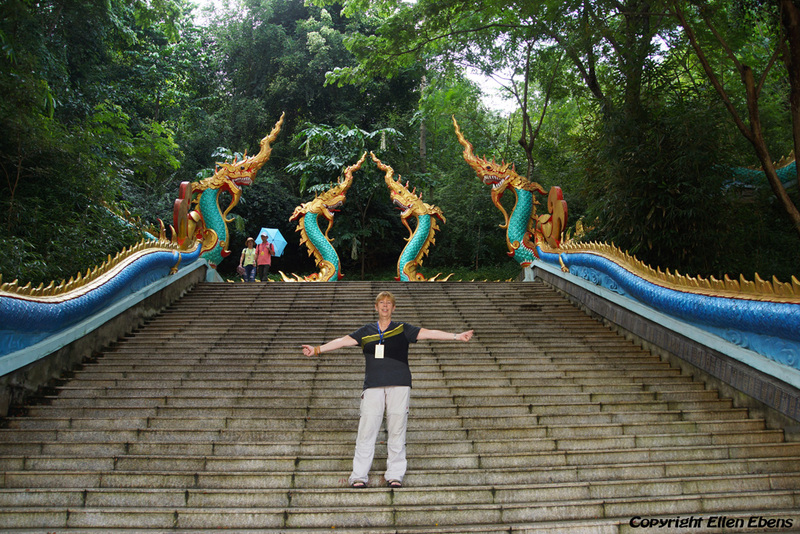 Visit to the temple on the island in Fuxian Lake. 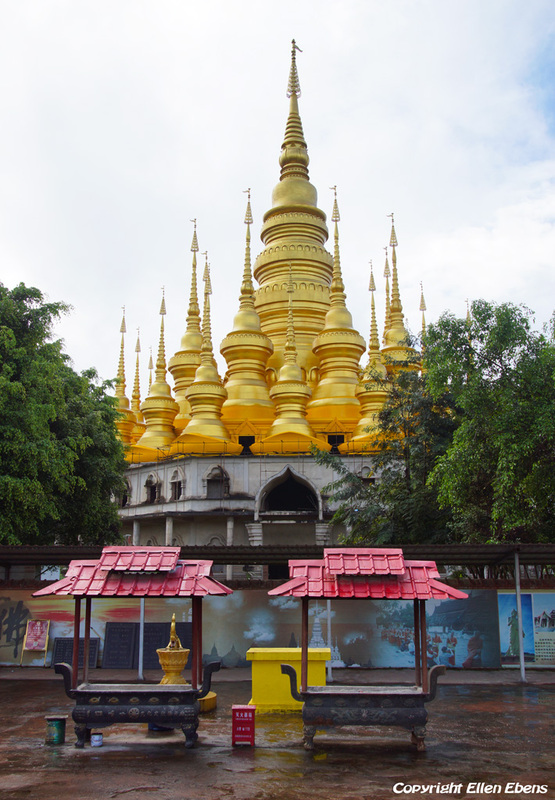 Visiting Meng Le temple at Jinghong and visiting the White Bamboo Shoot Pagoda outside the village of Menglong near the border with Myanmar. In the afternoon driving north and staying the night at the city of Lancang. Long day driving to New Dali and staying there overnight. 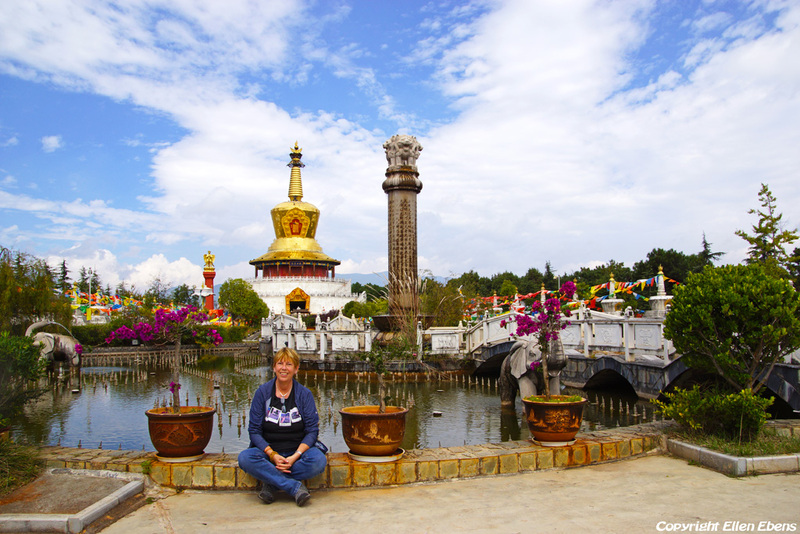 Visiting the Chongsheng Temple with it’s famous three pagodas just outside ancient Dali. 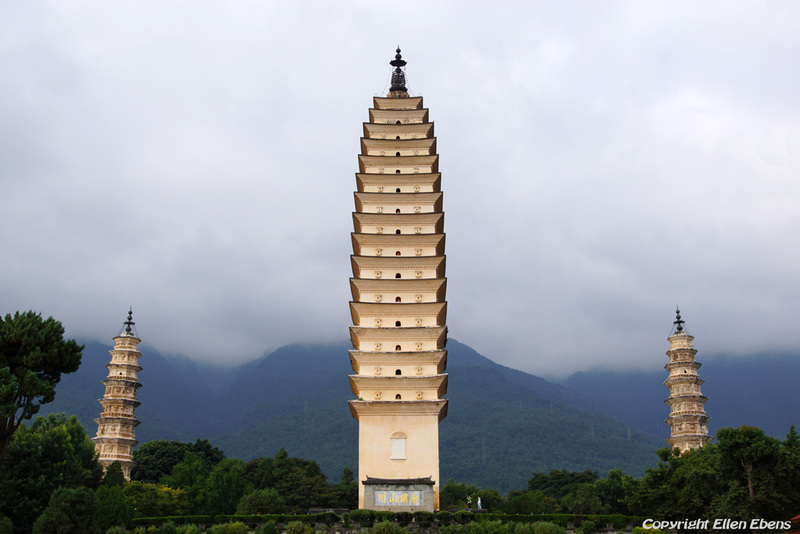 Driving to Jizushan Mountain and visiting the pagoda at the top of the mountain and other temples on the mountain. Staying the night in a hotel in the village of Jizushanzhen at the foot of the mountain. Driving to Lijiang and visit to the Golden Pagoda on Sheshan (Snake Hill) at the outskirts of Lijiang. 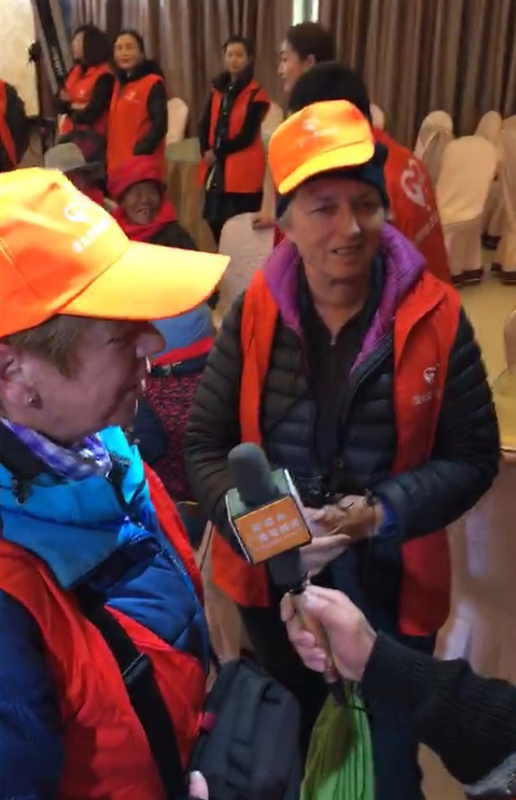 At the end of the afternoon visit to the Ancient city of Lijiang. 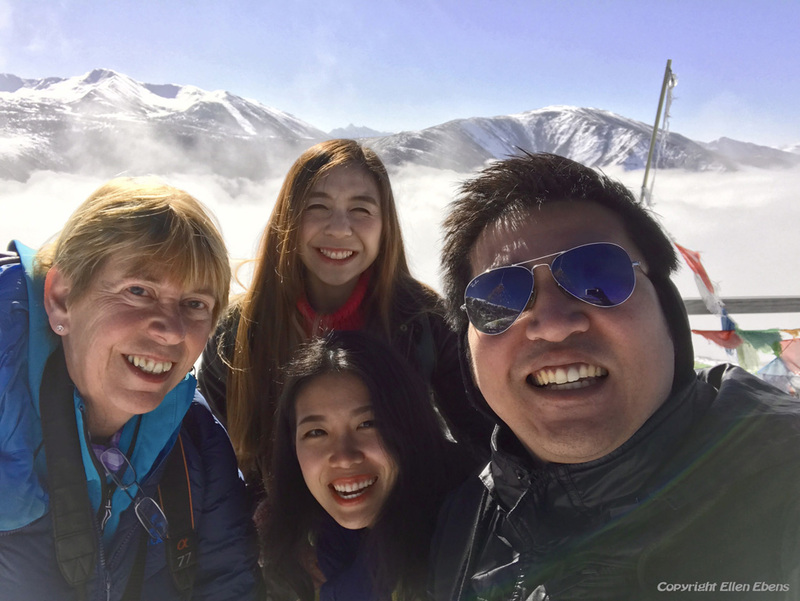 Driving to Lugu Lake and visit to the lake. 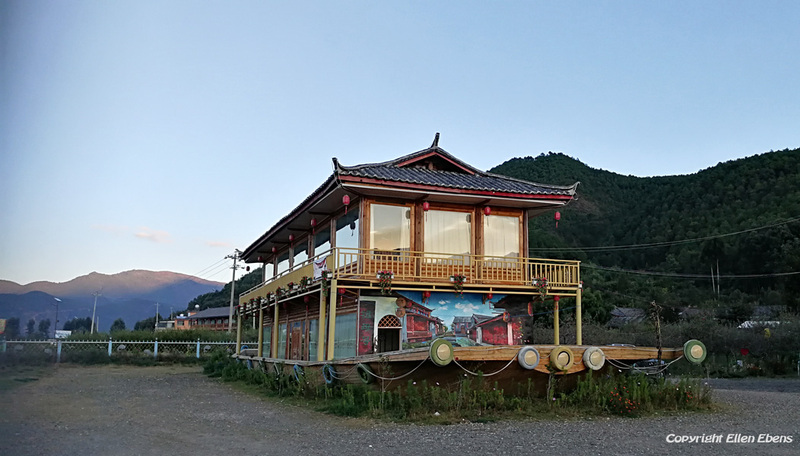 Staying overnight at Lugu Lake. Driving to Chengdu and arriving there in the afternoon, having a nice hotel near the airport above a big shopping center. Early start of the day with driving to Songpan. Arriving in Songpan at Emma’s Kitchen & Guesthouse in the early afternoon. 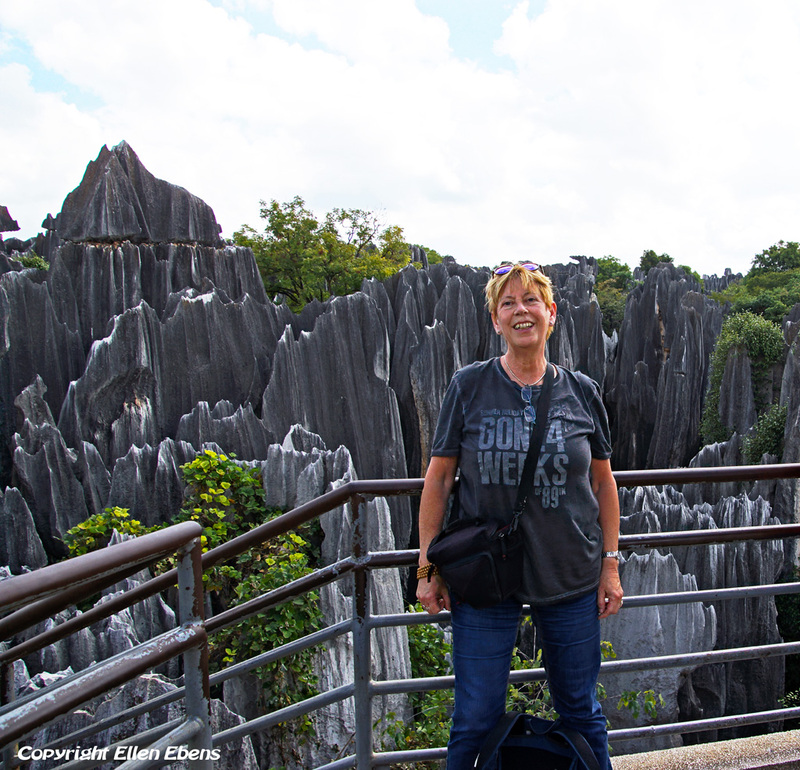 Staying at Songpan, visiting Zhaga Waterfall and Mounigou NP. 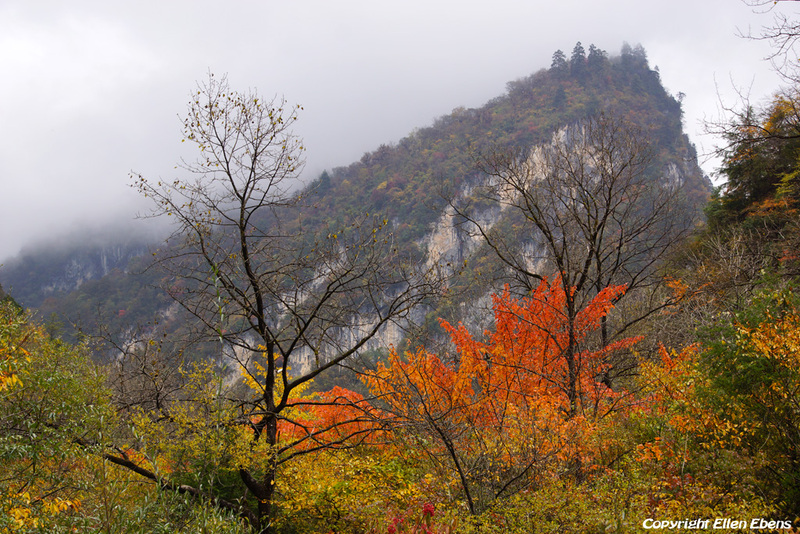 Staying at Songpan, enjoying the gorge with beautiful red autumn colors at the Danyunxia Scenery. 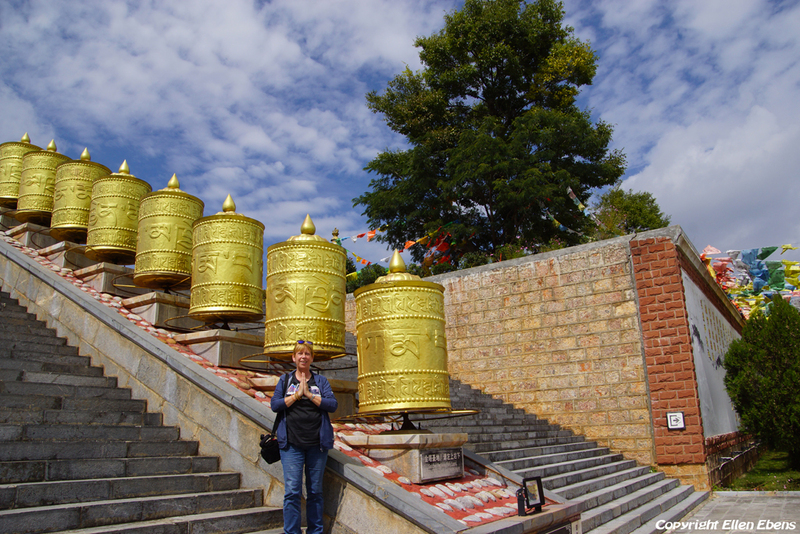 Staying at Songpan, visit to Kyangtsang Temple at Shanba village and a small valley with a lot of stupas and prayer flags. Relaxed day at Chengdu. Visiting the Wuhou temple and Peoples Park and having tea there at tea terraces. Weer prachtig Ellen, ik kijk graag mee naar je belevenissen! Enjoyed reading about your travels in more detail, Ellen. Thank you for sharing!